A leaf, pale gold and curled, lifts from a branch and rises in the updraft of an easy, cold breeze. It’s the middle of February, near the end of a rough winter, and somehow that leaf had been holding tight to its branch for all these months, through several feet of snow and the hard bite of blizzard winds. Then, on a sunny morning in a halfhearted breeze, it finally lets go. I watch it twist and roll on an invisible current, never losing altitude, until it disappears around the corner of the house. That, I think. I want to feel like that. By the time I left Arizona (and long before), I was exhausted from trying to hold together a life that was built on half-truths and disappointments. I made bargains, I made do and called it enough, even as I felt pieces of myself disappear and wondered if they were gone for good. And now, after holding on to so little for so long I’m trying to figure out how to ask for something better. It’s out there. I’ve seen it, I know. In the slant of light through a window, in a bit of good news, in the voice of a friend. You’re doing all right, you know? Do you know how far you’ve come? Yes, I know. I do. Some wounds are so deep and layered that they have to heal from the inside out. There are days when I’m overwhelmed with a sadness, out of context to anything else that might be happening, that’s hard to shake. I try sometimes to push it back with busy-ness or mindlessness, anything to break it into pieces and scatter it, but that usually just makes it last longer. There’s nothing to do, really, but to ride it out and know that it will pass. And it does. About 11 years ago, I read Letters To a Young Poet* for the first time. The book is a collection of ten letters written by Rainer Maria Rilke to Mr. Kappus, a student of one of Rilke’s own teachers. The letters, over a hundred years old now, are scripture to me, and I’ve turned to them over and over through the years, finding something new each time I read them. Letter 8 is one of my favorites, and I remembered it yesterday. I hope you’ll forgive me for posting so much of it here, but I can’t paraphrase it well. You can read the whole thing if you have time. That is why the sadness passes: the new presence inside us, the presence that has been added, has entered our heart, has gone into its innermost chamber and is no longer even there, is already in our bloodstream. And we don’t know what it was. We could easily be made to believe that nothing happened, and yet we have changed, as a house that a guest has entered changes. We can’t say who has come, perhaps we will never know, but many signs indicate that the future enters us in this way in order to be transformed in us, long before it happens. And that is why it is so important to be solitary and attentive when one is sad: because the seemingly uneventful and motionless moment when our future steps into us is so much closer to life than that other loud and accidental point of time when it happens to us as if from outside. The quieter we are, the more patient and open we are in our sadnesses, the more deeply and serenely the new presence can enter us, and the more we can make it our own, the more it becomes our fate…People have already had to rethink so many concepts of motion; and they will also gradually come to realize that what we call fate does not come into us from the outside, but emerges from us. So you mustn’t be frightened, dear Mr. Kappus, if a sadness rises in front of you, larger than any you have ever seen; if an anxiety, like light and cloud-shadows, moves over your hands and over everything you do. You must realize that something is happening to you, that life has not forgotten you, that it holds you in its hand and will not let you fall. Why do you want to shut out of your life any uneasiness, any misery, any depression, since after all you don’t know what work these conditions are doing inside you? Why do you want to persecute yourself with the question of where all this is coming from and where it is going? …In you, dear Mr. Kappus, so much is happening now; you must be patient like someone who is sick, and confident like some one who is recovering; for perhaps you are both. And more: you are also the doctor, who has to watch over himself. But in every sickness there are many days when the doctor can do nothing but wait. And that is what you, insofar as you are your own doctor, must now do, more than anything else. So, I’ll do that. I’ll wait to see what good things, what fate, emerge from this sadness. Wait and let go. And, weightless in the updraft, I’ll trust something I can’t see, without any idea, any idea at all, where I might land. i am so happy to be reading you again. SO much has happened to me over the last year as well. major life changes. things i never thought i would be brave enough to do. and through it all there has been sadness. sadness over the end of things. your blog always speaks to right where i am. thanks. oh…one of my changes is a new blog. Perhaps it is why I get up every day and walk around within and amongst the moments that are my life. I know I will find release, but must tolerate, perhaps even help orchestrate, the laps around the nurses station. Thank you for sharing your struggles, my friend. I am with you . . . SUCH wise advice. And I admire your willingness to “let go of so little” so your hands are free to grab more. Thank you for resuming your writing. I so enjoy it. I know the “sadness,” and I find that some days it hides away and other days it rages. There is much to hold on to in Rilke’s words: “You must realize that something is happening to you, that life has not forgotten you, that it holds you in its hand and will not let you fall.” You are not forgotten – those who love you will hold you up. oh good grief. this is exactly what i needed to hear. thanks so much for this. Hang in there, pretty Jennifer H.
Chris’ mom and I think alike. I have always thought that around your pain is a longer journey than through it. I echo the other commenters–it is wonderful to have you back and to read your beautiful prose. Healing from the inside out. Takes longer but makes for a stronger mend. How come everything you say sounds so beautiful? You write so beautiful. I’m experiencing big changes with deep sadness; your words transcribe it so well. My dad always told me “the sun always rises again tomorrow ..” and at my down moments, I think of him. A new day, a new adventure .. I believe for the every moment of sadness, there will double the happiness coming. Please keep writing! Oh that was beautiful and now I want to add this to my ‘books to read’ stack. It seems were all somewhere in the midst of this now. Profound. Hard advice to follow, at least for me. I’m the type who always wants to fill the sad and still moments with distraction. I want to read these letters. And I’m so glad you are writing here again. One, because I want to know how you are faring. Two, because I just love the feeling and poetry in your words. 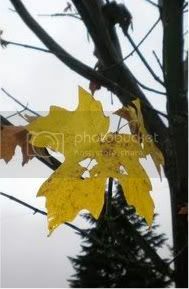 The yellow leaf clinging and then floating off, simply perfect. There’s so much here. I feel full, if that makes sense. “And, weightless in the updraft, I’ll trust something I can’t see, without any idea, any idea at all, where I might land.” Me too. This is beautiful. It’s so hopeful, that view of sadness, that it has a purpose, that it is more than just Is. I’d love that to be true for you, Jennifer. I hope it is. always thinking of you. thank you for sharing this beautiful prose. I think of you so often. You have a quiet self-reliance, this strength that comes through your writing. I know you will make it through to the other side, but I’m sorry for the sadness now.